Hey guys! Skin fair is in full swing, and I wanted to give you a sneaky sneak peek at the exclusives that Lumae has out for the event! Skin fair runs from March 10th to the 26th, and Lumae has skins out for the Catwa, Lelutka, and GA;EG mesh heads! Below I’m showing the Aurora skin in tone #1 – Milk on the Lelutka Simone 2.0 bento head but it will more than likely work on most heads by Lelutka. Always try a demo if you’re in doubt! My lingerie is an absolutely breathtaking set from Sn@tch, out right now at a unique event called Applique. This set comes in 10 pastel colours, and includes omega appliers, for all of your mesh body needs! I cannot get over the delicate lace and ruffles on this set… Ivey has truly outdone herself once again! While you’re checking out the other two events (Skin Fair, and Applique), you should head over to Totally Top Shelf! 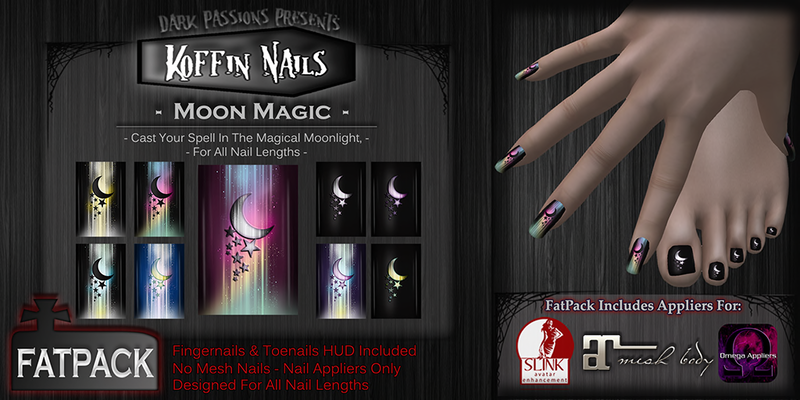 There are tons of designers with lots of wonderful items, like my nails from Dark Passions! The Moon Magic set is exclusive for the event, and is available in Maitreya, Slink, and Omega packs, and also a fatpack of all of those appliers! Here’s the full AD for the nails, so you can see them in all of their glory! Hair: Truth – Zoya – Brunettes/Fatpack – VIP Group gift! – $L350 to join! Hands: SLINK – Avatar enhancement hands – Pack 1+ BENTO! ← Beautiful, Springy, $L25… part 2!